Last summer I manned one of the stalls at the local Sustainability Festival in the nearby town of Woodend. That day, I met a whole bunch of lovely people. It was a really fun day and it was also great to talk with so many people that were interested in local produce and also growing your own foodstuffs. A few days ago, the editor and I were picking free sun ripened apples from various wild apple trees located in secret spots known only to us. It was then that I was reminded of the Sustainability Festival. The reason for the reminiscing was that one young couple who approached me at the festival demanded to be told of gleaning opportunities (this is the fancy word for fruit picking free fruit) for any free and wild fruit within the mountain range. It was a surprisingly pushy demand given that I didn’t know them and that they had offered absolutely nothing in return for this precious and hard won knowledge. I decided not to disclose the secret locations of all of the wild fruit that I knew about in the mountain range. After all, that information is secret and hard won! However, it was also late summer and the young couple expressed the belief that much of that wild fruit was ripe and ready to glean. It was at that point in the conversation, that I had a lot of difficulty getting across the concept that different plants and fruits ripened at different times of the season. They just didn’t seem to believe me. The demand for my secret information took me by surprise, however it kick-started my brain into thinking about how humans relate to nature. When humans consider the surpluses provided by nature, they somehow seem to have developed a just-in-time mentality and I wondered how that happened. Just-in-time refers to a manufacturing process whereby minimal supplies are kept on hand for use by the manufacturer and items are usually only produced as they are ordered by customers. The whole point of adopting the process of just-in-time for manufacturing is because it reduces costs for the manufacturer. The parts used and stored finished goods are kept to an absolute minimum. I’m tight with money, so I understand that. Alert readers would already have noticed that I deliberately wrote: “it reduces costs for the manufacturer” and that is an important consideration because the policy usually results in increased costs for the suppliers (to the just-in-time manufacturer) of parts used in that manufacturing process. The suppliers of the parts carry the cost of storing the parts used. The suppliers also have to be ready to deliver those parts to the manufacturer at a moment’s notice. Even though I am tight with money, I feel that this is unfair to the supplier. After all they might be tight with money too. Humans may want to operate on a just-in-time basis, but Nature certainly doesn’t. When nature produces a surplus, you have to harvest and store that surplus. Very few wild fruit trees have their fruit left untouched. The animals, birds, insects – even the soil life all wants a bite of that yummy fruit. That also applies to other surpluses that nature provides, including: sunlight; heat; water etc. Here at the farm, I store all manner of natural surpluses. So, this week found me converting the free dessert apples into apple cider/wine for later consumption. In this case, later consumption refers to about six to twelve months into the future. Plus there was a yummy apple cinnamon cake. If those apples were left on the wild fruit trees waiting for a just-in-time need, the birds and insects would have consumed them instead. Another surplus stored this week were the various ripe plums. 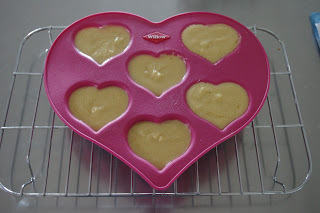 They were processed using the food dehydrator. 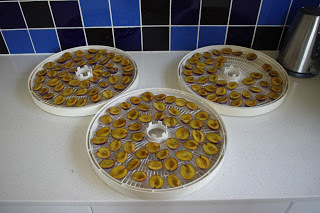 It is interesting to note that both the dehydrating and cider making processes require lemon juice. 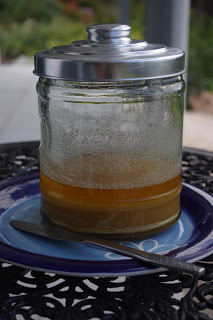 Unfortunately, citrus fruit are a late winter fruit here, and regular readers may recall that last winter I froze the juice from dozens of lemon and lime fruit for this exact purpose. Oh yeah, the citrus is added as it assists with preservation of the fruit in the drying and cider making as both these processes need an acidic environment. The acid from the citrus makes the processed fruit more toxic for any stray bacteria to consume. Thats not getting tricked by the just-in-time business fad! I wouldn’t want to be operating on a just-in-time basis with water either as I’d probably die of thirst. However, the extra rainfall over the past few days has started the slow process of refilling the water tanks. Earlier this week we continued the long and slow process of cutting, splitting and stacking the seasoned firewood in the original firewood storage shed. 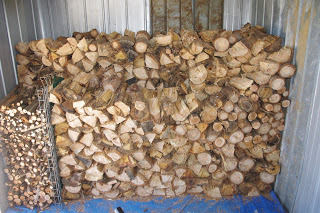 The process of storing firewood will continue each week for the next few months. 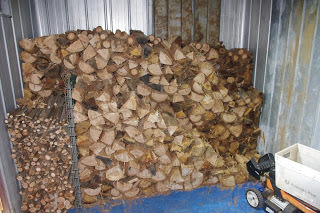 Stacking seasoned firewood in the firewood shed slowly over a few months allows for increased air flow over that stored firewood which in turn assists with the drying of that firewood. Running short of firewood means operating on a just-in-time basis, and in the depths of winter when the air is at 99% humidity for weeks on end, and it is almost impossible to source any dry firewood from your property. Need I add that this is another example of storing a surplus from nature for later use? In breaking tomato news: Forget about all else because on the very last day of January, I spotted the very first ripe tomato on the farm. We haven’t yet tasted that particular tomato, but the editor and I are hoping it has an excellent taste, because not only is this particular plant the most heat and dry hardy of any of the tomato plants grown on the farm, it is also ripe one full month earlier than any other tomato plant that I’ve ever grown here! There are also plans to store the excess tomato harvest, which will be revealed in a few months time! Take that just-in-time. 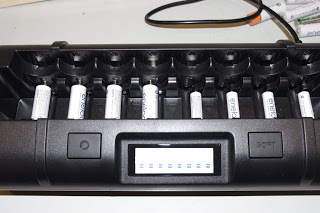 Speaking of breaking things, over the past few weeks all of the rechargeable batteries that I use in various small devices (eg: camera, torches etc) seem to have lost their zest and vigour! Seriously, they all barely hold a charge anymore which means they run flat in minutes. 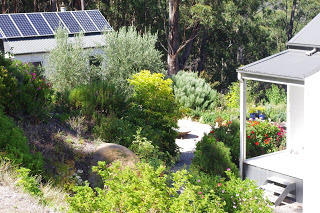 As many of you would be aware, this house has an off grid solar power system which provides 100% of the household power all year long. 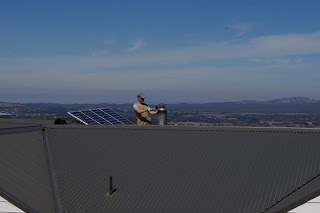 The off grid solar power system uses huge expensive batteries and I treat them very gently and carefully and have had to gain a solid understanding about their chemistry and care in order to gain the longest possible life span possible for them. On the other hand I hadn’t given a second thought to all of the little rechargeable batteries that I use. Given that I’m tight with money, I’m constantly driven to obtain the longest life span for all of the technology and tools used here. This week I had to research those pesky little batteries, and to my shame I now realise that I have been mistreating the hard working little batteries. However, I now know far more about their chemistry and care and am making up for my past dodgy ways. They are very complex bits of technology and need almost as much care as the huge household batteries in order to achieve the longest lifespan. To this end, they now get to enjoy TLC in a new high end recharger. One thing that I wish nature wouldn’t supply in excess, is the extreme UV over high summer. If you haven’t felt extreme UV burning your skin, you might not appreciate my concern! I’ve now noted that the extreme UV rating here seems to occur four weeks either side of the summer solstice. And it burns your skin even through solid cloud layers. This week is now more than four weeks past the summer solstice and the UV is now mostly being rated as only “Very High” rather than extreme. I have now noticed that in the orchard in the shade of the fruit trees, the grass is slowly beginning to turn green again. I’ve long suspected and observed that the extreme UV dramitically slows and/or stops much of the plant growth for many of the short lived annual plants. The many bushfires burning around the continent are still continuing to produce the most spectacular sunsets over the farm, and again this week was no exception. Some people may believe that all of my talk about reaching the dreaded time of Peak Rocks was in jest. Au contraire my friends! Peak Rocks is the time where all of the easy to obtain rocks used in the many rock walls here have been recovered. The reality of Peak Rocks means that I now have to travel ever further afield just to maintain the rock supply for new rock walls. What a disaster! 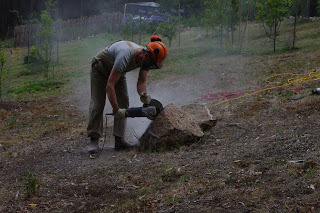 This week, using technology, I have dodged the dreaded Peak Rocks for a while at least, as I have begun cutting up some of the many larger previously unmoveable rocks into much smaller and more easily managed rocks, which are just perfect for the many new rock walls. 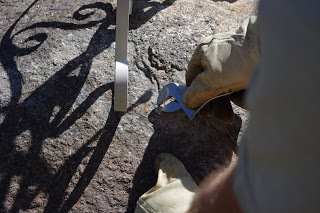 The rocks here are very hard and dense, so producing smaller rocks from much larger rocks involves scoring the surface of the rock as deeply as possible with a diamond tipped rotating cutting blade on an electric (solar powered) grinder which you can see in use in the above photo. Observant readers will note that part of the original rock has already been cut away into a rock wall sized rock. 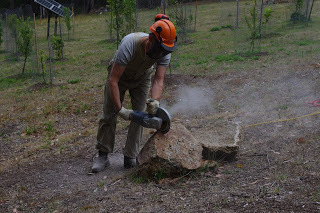 The next step is to use the electric (solar powered) jackhammer to dig into the scored cut in the rock and then hopefully sooner or later a section of rock breaks away. 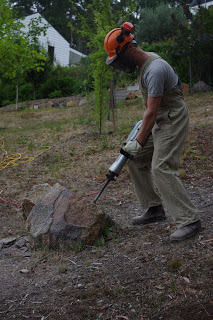 The jackhammer has to be worked along the entire cut in the rock for the rock to eventually break. In the photo below you can see that I use my leg to support the weight of the jackhammer which saves me straining my lower back. As a fun fact, the largest of those three rock chunks weighs nearly as much as I do! The temperature outside now at about 6.30pm is 25.5’C degrees Celsius (77.9’F). So far this year there has been 40.4mm (1.6 inches) of rainfall which is up from last week’s total 23.8mm (0.9 inches). Tomatoes are the most productive crop on the farm. Sun ripened tomatoes, bursting with flavour are a real treasure and if you love the fruit as much as I do, you’ll always be able to recall the beautiful smell of a ripe tomato fruit. This season, I reached for gold because I more than doubled the number of tomato plants that I usually grow on the farm. 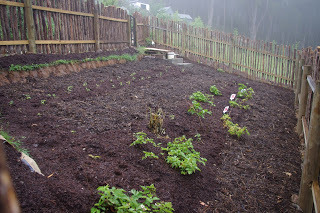 However, in order to double the number of tomato plants I also needed to double the garden space set aside for those plants. There are plans afoot to construct a purpose built tomato and strawberry bed over the next few months, but way back in October 2015 when the tomato seedlings were ready to be planted out, talk of purpose built tomato beds was exactly that: only talk! There are hundreds of ripening cherry tomatoes now in the berry enclosure. At this point, it is worth mentioning that I’m quite excited by these cherry tomato plants as they are the product of about four years of continuous seed selection as the editor and I have selected seed every year from various plants based on taste and also early ripening. It is also worth mentioning that they are an eclectic mix of colours including: Red, Orange, Yellow, Black, and Green/Black. 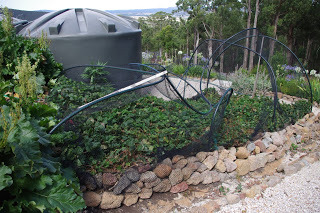 There is however, one minor problem with all those tomato plants in that berry enclosure: I can no longer get in there to pick the ripening fruit because the growth is so feral! The lesson that I have taken away from this experience is that tomato plants don’t necessarily require staking and support in order to grow. 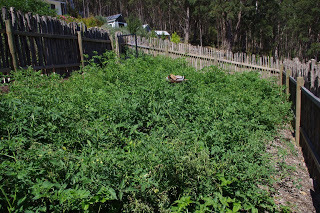 In the above photo you can clearly see that the tomato plants are happily climbing towards the sun and are all self-supported or climbing all over their neighbours. 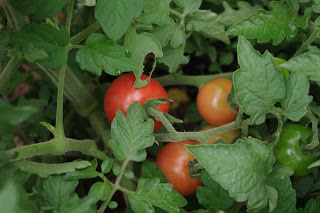 Tomato plants actually require containment, and so I believe that the purpose of staking those plants is containment and also to train the plant to a more easily manageable shape so that it is easier to pick from. No one seriously wants a thicket of Triffids at the bottom of the garden! Today the editor and I placed some temporary fencing in the tomato jungle and we can now access most of the rapidly ripening tomatoes. 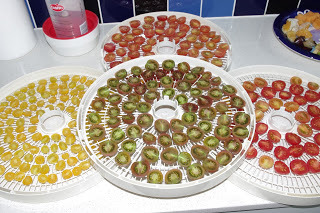 On that note, the tomatoes will continue to ripen from now until early winter (June) at which point the plants rapidly die and the remaining green fruit will be either brought inside the house to slowly ripen during the winter or be converted into green tomato chutney. 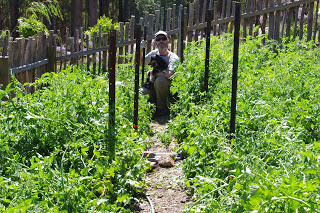 As an interesting side note, there doesn’t appear to be much challenge in playing the game: “Where’s Toothy?” this week because I had to pick him up during that activity earlier today, because I was trying to stop him from hunting all of the frogs and reptiles that happily live in amongst the tomato plants. All of the lessons learned from the tomato jungle will be incorporated into the future tomato enclosure. Had I mentioned that the weather has cooled this week? I’m seriously over summer, and whilst I realise that if you are reading this in the depths of a Northern Hemisphere winter right now, that that statement may sound a bit odd. But it has been really hot, and I’m over it! Anyway, this week the weather has started to cool as the days are becoming slightly shorter. Yay! What does 114A actually mean? Well, it is a lot of electricity for sure, but it refers to 114 Amps (A) x 36.5 Volts (V) = 4,161 Kilowatts (kW) at that point in the day. It is certainly enough electricity to fry an egg, no doubts about it and you certainly wouldn’t want to test the wires using your tongue! Ouch! 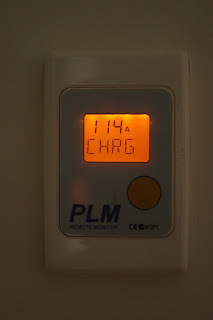 It is probably also worth mentioning that about 20% of that electrical energy is lost because batteries aren’t that efficient and can only store that 114A at about 29.4V = 3.3kW. All the same it is excellent to see such huge output from the solar PV panels. Last week I wrote about just-in-time systems. The conclusion from that discussion was that nature simply does not operate on a just-in-time basis and any surpluses that nature provides must be stored for future use. 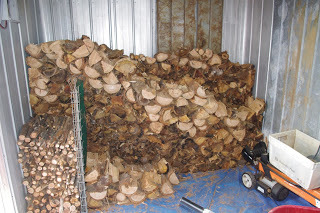 Firewood is a great example of that sort of storage and this week I’ve continued filling the original firewood shed. I actually have no idea how much firewood I require in any one year, because every year that I have lived here, I have run out of stored dry firewood. 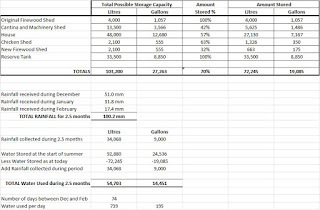 This year, with the second new firewood shed, I’m determined to discover exactly how much firewood I use in a single year. Knowing that metric will assist with the process of managing the firewood resources here because firewood is one of those sorts of resources that you have to manage many years in advance of the actual use. I reckon that there are another two months of work cutting, splitting and hauling firewood will fill up the original firewood shed. 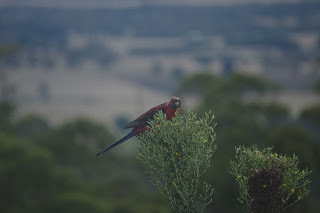 Really observant readers will also note in the above photo a magpie and on the edge of the forest there is also a very fat looking – and fruit tree fed – wallaby. The cooler weather has somehow induced people to commence socialising again. I’ve noticed that many people – not all though – tend to hibernate during the very hot and very cold parts of the year. They then emerge during the in-between seasons proffering invites to many social occasions. This week was totally feral for social catch ups and one of them was with some friends of New Zealand origin who were celebrating Waitangi Day with a barbeque. 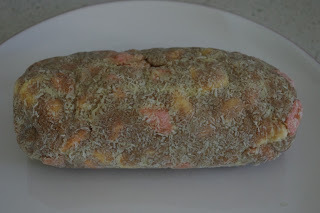 The editor – who is perhaps a bit more cheeky than I – decided to prepare a dessert that was of distinctly New Zealand origins. And so the Lolly Cake was made and delivered! 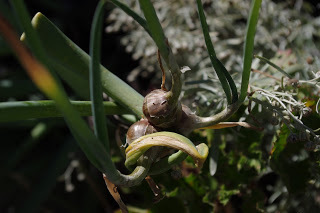 One of my favourite plants which is the Egyptian walking onion are producing bulbs this week. The plants are virtually indestructible as I have never watered or fed them and every year they produce lots of bulbs in the air and below ground level. And if you want new plants, you simply plant the bulbs and a new plant will show up next year with even more bulbs. The entire plant is edible too. One of my favourite activities is finding quirky metalwork in small country markets. A few months ago the editor spotted an unusual piece of metalwork globe art and even though we purchased it for a “throw out” price, we love it, but had absolutely no idea what to do with it. 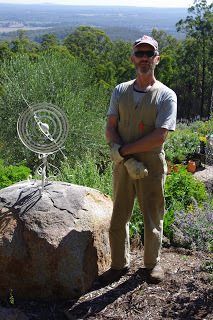 One day I casually mentioned that we should place it on a rock above the courtyard garden and before I knew it, I was installing the metalwork onto that rock. The metal artwork has a great view doesn’t it? The circles spin in the breeze too. 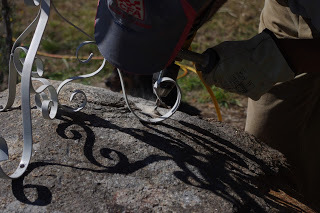 Attaching the metalwork to the rock was simplicity in itself. 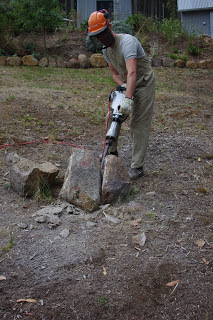 I first had to drill holes into the rock. Dynabolts were then inserted into the holes in the rock. A dynabolt is a bolt with a metal sleeve over it which expands once the nut is tightened. By the action of the expanding sleeve, the bolt lodges itself into the rock. They are very strong and can used to attach anything to brick, cement or rock. And before I knew it, the metalwork was permanently fixed into place and enjoying a spectacular view from above the house. On an entirely different note, the page to this blog which shows the flowers that the European honey bees are enjoying has been updated today for February flowers. However, there is a plant that the bees love, but I have no idea what it is and was hoping that someone out there in Internet land could possibly identify it? 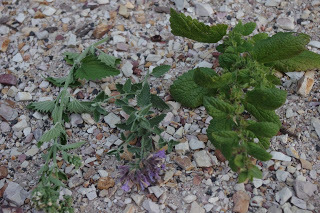 I’m not sure, but it may be a salvia of some sort? The temperature outside now at about 9.00pm is 14.8’C degrees Celsius (58.6’F). So far this year there has been 49.2mm (1.9 inches) of rainfall which is up from last week’s total 40.4mm (1.6 inches). 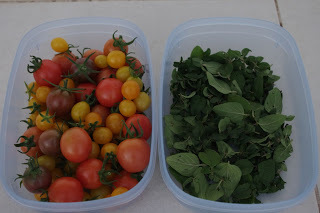 Many people know that the editor and I grow a lot of our own food. It has been an interesting week because a number people have discussed with us how to go about growing their own produce. What interests me about this salmonella outbreak is that farm is located not too far from here in an area that has supported major commercial market gardens for a very long time. With the two other recent food poisoning cases (eg: frozen berries and eggs), I’ve often noticed that if the food product is imported people can easily dismiss their concerns as: Dodgy overseas food handling practices. Likewise, if the food was sourced from a small farm then people can dismiss their concerns as: Dirty hippy food. However, this time the farm involved in the salmonella outbreak was a major commercial facility who were supplying the two big supermarket retailers (which make up over 70% of the market in Australia). 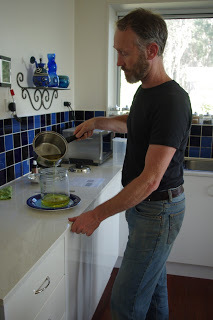 Pre-packaged lettuce is very innocuous and very few people would consider it to be a risky product, but at the same time people have been discussing how to grow their own produce with us. My gut feeling is that what we are seeing with this incident (and the other recent ones like it) is cracks forming in the industrial food production processes. 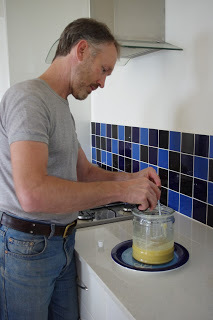 By growing or foraging some of my own food, I am able to minimise my reliance on the industrial food production system. Speaking of foraging, the wild blackberries in this area have finally started to ripen this week. 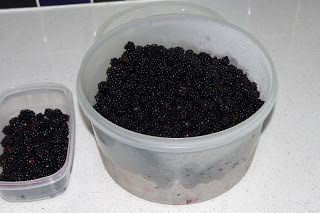 The local council contractors regularly poison the blackberry canes in this mountain range, but I’m aware of one or two spots that they are unaware of and every year I pick enough fruit for fresh eating and jam making. Of course fruit on wild blackberry canes doesn’t all ripen at once and so you have to pick the fruit over a number of weeks. 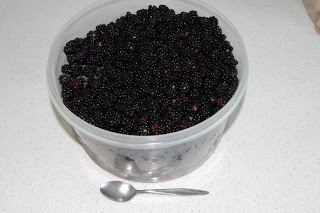 I pick the blackberries every week and store them in a large container which I keep in the freezer until the container is full – or the blackberries are no longer ripening on the cane. Once the container is full, I then produce a huge quantity of homemade blackberry and rhubarb jam. Hopefully enough jam will be produced to last longer than a year. Did I mention that this week the weather has been warm and dry? The heat of Saturday was also a good day to check on the oldest bee hive. The bees generally keep the internal temperature of their hives at about 35’C (95’F) as that is the optimal temperature for raising brood. Observant readers will recognise that many species of animals – including us humans – operate at a more or less similar internal temperature. The oldest bee hive here comprises three brood boxes. 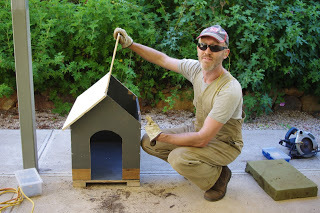 The term brood box is simply the fancy name for a box that the bees are allowed to raise new brood in (i.e. new bees). 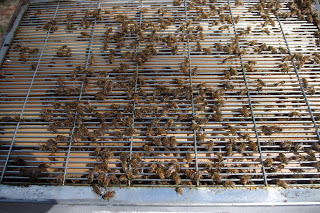 Three boxes of brood can produce an awful lot of bees! 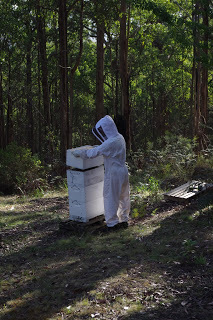 With the heat of that early afternoon, I could smell the honey in the oldest hive from about 10m (33ft) away and at the same time the buzzing from the colony was quite audible as a sort of droning noise. I thought that it would be a good idea to open up the hive and have a look inside. Opening up a hive on a hot day is a good idea for the bees because they lose less of their precious internal temperature that they’ve worked so hard to produce. Conversely, it goes without saying that opening up a hive on a cold and windy day is a total disaster for the bees. Once the hive was opened I could peer inside and see if the bees were enjoying themselves. It was quite a surprise to me to find that they had almost completely filled the third highest brood box (i.e. the box on top). Bees are clever creatures because if they run out of space, they simply select a new likely spot for the colony somewhere out in the forest – with a second living area, and possibly a second bathroom of course! – and then head off with the Queen, part of the colony and much of the honey. That leaves behind just enough bees to continue the original colony. As a beekeeper, you have to anticipate the needs of the bees and provide them with extra space (i.e. another box) so that they don’t leave taking the majority of the colony (and their honey stores) with them. With that concern in mind, I set about adding a fourth box to the existing three box colony. Observant readers will note that the above photo has a metal mesh on top of the third brood box. The metal mesh is a Queen excluder and that is a fancy name for a mesh which allows the worker bees to move through the mesh, but because the Queen is too large (as she is double the size of most bees) she won’t be able to squeeze through the steel mesh. The reason the Queen excluder steel mesh is in place is because I don’t wish to have any brood developing in the new and fourth box that will be placed on top of that steel mesh. The technical name for the fourth box that the Queen won’t be able to lay eggs in is a “Honey Super”. 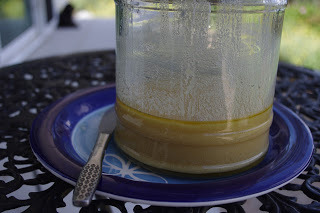 So it is my hope that the very large colony of bees will set about filling that new Honey Super with… Honey. My approach with the bees reflects a lot of the systems on the farm here in that I want most systems to be abundant, but not necessarily that productive. The goal of that strategy is a more resilient outcome. 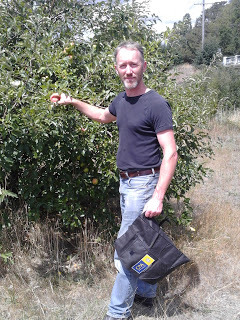 For example, there are over three hundred fruit trees in the orchard and not every tree is productive every year, but at least every year I get some produce from some of the trees. With that goal in mind, I want the bees to have as large a colony as they can maintain which means that they will be a stronger hive and thus be more easily able to respond to any shocks without the many dramas that a smaller hive will confront – and there are a lot of dramas that the bees have to deal with these days. If I get a small amount of honey for my efforts then that is all I expect. Before I could place a fourth box on the hive, I had to quickly (well, about two hours work for 16 frames) make up the frames that the bees live on. 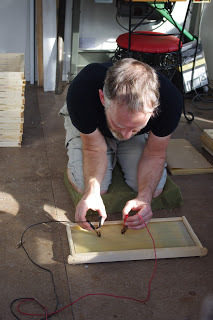 Frames are timber squares with a sheet of wax melted onto thin steel wires threaded through the timber frame and the frames are then placed into the bee box. I use a car battery charger to make the wires hot enough so that they melt into the wax sheets. A person could just as easily use a battery in place of the charger. 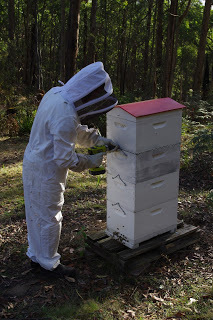 I then got into my bee suit, removed the red roof of the hive and placed the new box (which holds 8 frames) onto the existing three boxes. All the while the bees are buzzing around and getting slowly more and more annoyed by my actions. Put it this way, bees don’t like being disturbed! The job was almost complete and the editor moved in a bit closer to take a great close up photo of the action. Now the editor wishes to remain anonymous so I can’t show you, the readers, how much she has suffered over the past few days, purely for your reading and viewing enjoyment. 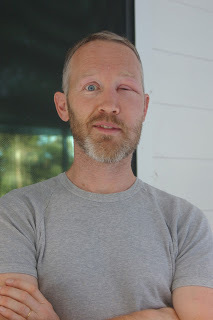 However, so you get a feel for her overall look, here is a photo which shows the results of a bee sting that I received on the side of my head two years ago. As an interesting side note, I also opened the garden that afternoon to a local gardening group and they were very nice about the fact that half of my head looked a puffer fish! The reaction to the venom is what is known as a localised reaction and it is pretty typical of bee stings. As an interesting observation, we have noted that the regular consumption of honey (and anti-histamines) afterwards helps to reduce the inflammation. This effect was discovered purely by accident when the editor consumed a glass of mead which had a noticeable anti-inflammatory effect. We weren’t going to produce further mead as it is an expensive wine, but may brew up another batch or two over the next few weeks just to have on hand for such emergencies! 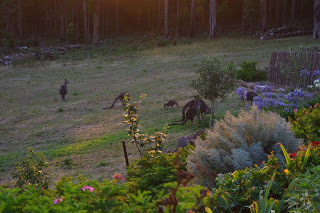 As the summer continues and there is less green pick for the wildlife, the wallabies have conducted daring night time raids on the strawberry enclosure. The cleaning brush comprises thick plastic bristles on a very long wire which you push up and down the flue so that the gunk in the flue falls into the wood heater below where it can be disposed of. 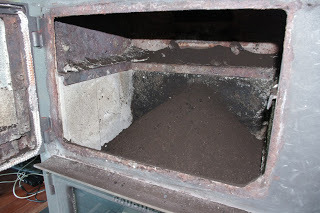 At the top of the flue is a cover which is usually described (for those that are technically inclined) as a cowl. The cowl had rusted through so I now have a stainless steel unit on order. The cowl stops rain getting into the flue and rusting out the heater. 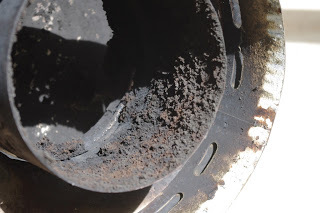 In the photo below of the cowl you can see just how much gunk had built up over five years of use. And then there was the mess which I’d brushed from the flue and was now collected in the wood heater for disposal in the garden. The temperature outside now at about 6.00pm is 25.5’C degrees Celsius (77.9’F). So far this year there has been 49.4mm (1.9 inches) of rainfall which is up from last week’s total 49.2mm (1.9 inches). 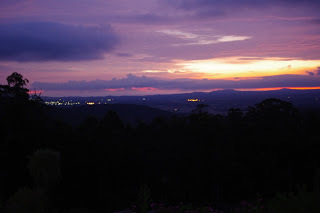 Friday morning found the editor and I awake before the sun had even risen. Usually, it is an unwise person that would attempt to discuss important matters with me before breakfast. No one is safe in that regard and even the editor is shooed out of the kitchen should she attempt cheery banter before breakfast. It is fair to say that I’m not an early morning person, but on Friday, I made an exception. That exception was for the Seymour Alternative Farming Expo which opened its gates on Friday morning at 8am. The expo is held every year in the town of Seymour which is on the Goulburn River. Seymour is a long drive from here through predominantly rural roads and it usually takes about an hour and quarter to get there. From past experience the Seymour Alternative Farming Expo is a hot and sunny event which I prefer to attend in the early morning thus escaping the heat of the afternoon. However, there is also another reason that I prefer attending the expo early in the morning. That other reason is because the Seymour and District Poultry club take over a large pavilion at the expo. The poultry club offers a huge selection of chickens (and other birds) for sale – raised by their club members – including various heritage as well as the more usual breeds. On the expo day, this means that the earlier that you visit the poultry club, the more likely you’ll be able to select and purchase the best of the best of the chickens on display. Them chickens, they sure sell fast! And so the editor and I were there early critically examining the various chickens for sale. We had many earnest discussions such as: “That one is listed as a hen, but don’t you reckon it looks like a bit like a rooster?” Amongst other such silliness. We did eventually more or less agree to two lots of chickens comprising: three black leg horn’s; and two isa brown chickens. Fortunately you can pick up the chickens when you leave the expo which means that you don’t have to carry them around all morning in the hot sun. All that decision making so early in the morning left me feeling hungry so we enjoyed a Polish cheese kransky sausage with onions in a bread roll and listed to bluegrass music whilst sitting on hay bales in the shade of a tree. Such is life in the country! The couple that were playing the bluegrass music were very good and they’d clearly lovingly made their own instruments from scrap. In between songs they told stories of the history of bluegrass music as well as the instruments. They earned their busking tip. Whilst chickens, music and food are an important part of a farming expo, they’re not the only part. We visited many displays of small holder farm machinery where we drooled over machines that we would like to own, but probably never will (how about that portable mill? 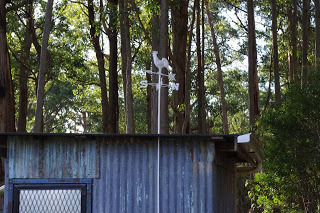 ), there were animals for sale, hardware knickknacks, craft stuff, chainsaw artists (they make great timber wombats), plants and pretty much everything you could ever need for a small holding. I even met a dude that manufactures steel water tanks from sheet metal and has a side line producing raised garden beds. I intend to purchase some steel raised garden beds from him over the next few weeks to replace the rusty ones here. All good things come to an end though, and the sun was fierce and the day heated up and so we left the expo and drove our way home again (with the new chickens, of course). 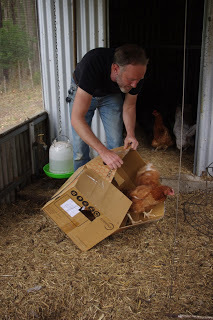 Once the two boxes were inside the chicken enclosure, I opened up the first and tipped out the two Isa Browns. The next box to be tipped out contained the three Black Leghorn chickens. 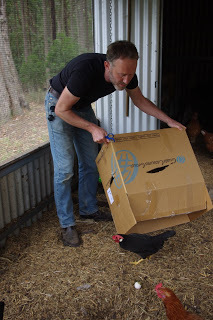 Observant readers will note in the photo below that an egg also dropped out of the box with those chickens. At the expo the birds were described as “point of lay” which is about 22 weeks old, and I was left with no doubt that that was a true statement! The thing that was not disclosed about the birds was that they are bantam chickens. Bantam is a fancy name to describe a smaller breed of bird. From hindsight it was obvious that the new chickens were bantams! Bantam chickens are quite good because whilst they produce smaller eggs, those eggs are not much smaller than what a full sized bird would produce, and the birds themselves eat far less than a full sized bird. My only concern with the bantams is that the other much larger chickens may give them too hard a time. The world of chicken is a rough place until the pecking order is properly established. 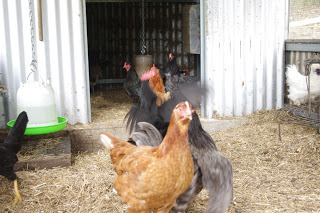 On the day of introducing the new chickens, a few wing, chest and beak fights broke out. 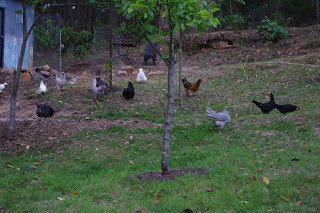 Eventually the new birds more or less settled in to life in the chicken collective at Fernglade Farm. It was hot at the Seymour Alternative Farming expo, and it has been hot here too. The valley below this mountain range is looking very dry and crispy. However, there is still a lot of green and colour in the gardens here despite that heat. Over the past few weeks I’ve been continuing to fill up the firewood shed with cut and split seasoned firewood for the coming winter. 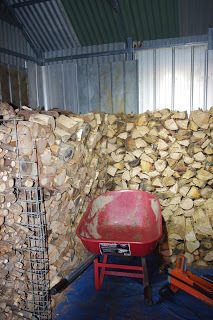 We have never been this organised with firewood before and it is a real pleasure seeing the original firewood shed fill up. I often quip to the editor that firewood in the shed is like money in the bank – but better. 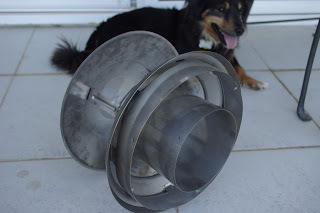 The replacement cowl (which is the fancy name for the bit at the very top of the chimney connected to the wood heater) arrived in the mail this week. The above photo shows the replacement cowl on its side with the bottom facing closest to the camera. 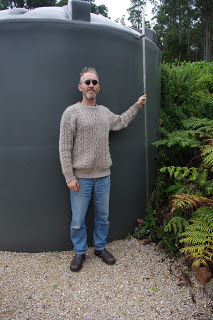 It is an impressive piece of steel work and it serves the function of stopping rain from falling down and into the chimney (for those that are technically inclined a chimney is described as a flue in this circumstance) and possibly rusting out the wood heater. The interesting thing about the old cowl was that when I removed it from the chimney, I discovered that the top half of the old cowl was made from stainless steel and in very good condition, whilst the bottom half was made from galvanised steel which was mostly rusted and full of holes. The old cowl was one of those situations where a manufactured item looked like you’d expect it to look like, but the materials used were not up to the job and so it failed. The only reason for that situation to occur is that it saves the installer a few bucks. I’m finding that many manufactured items are like that these days. 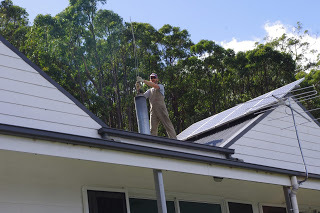 I used a rubber mallet to gently tamp the replacement stainless steel cowl onto the wood heater chimney (flue) and then anchored it with three metal screws to stop it from blowing away in the wind. Toothy the long haired dachshund who can be seen happily lurking in the background of the photo with the cowl above is occasionally bad tempered. No, please don’t defend Toothy, it’s true and there is no getting around that fact. Anyway, the other night, Toothy decided to pick a fight with the gentler natured but much larger dog Poopy the Pomeranian (OK, he’s actually a Swedish Lapphund, but don’t go giving him airs and graces!). Needless to say that Toothy lost that fight. However, Toothy made the unfortunate error of having that fight in the middle of the night which in turn woke me up. Toothy received the same sort of reaction from me had he decided to do the same thing before breakfast (Please recall that I’m not an early morning person). When cooler heads prevailed the next day, the editor and I discussed the situation and decided to separate the two dogs by constructing a new and smaller kennel purely for Toothy’s use. The scrap plywood was gathered into one place. Being naturally tight with resources, a template was drawn onto each of the plywood scrap pieces so as to minimise any potential waste. The individual plywood pieces were cut out of the scrap and then screwed together. Before too long a brand new Toothy sized kennel was constructed. 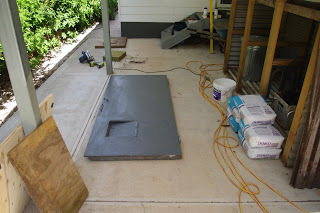 Observant readers will note in the photo below that the roof is deliberately hinged so that any dogs attempting to hide in their kennel can be easily removed. 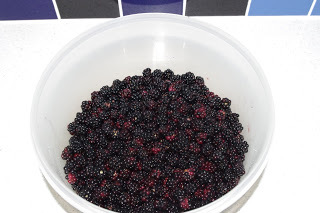 The festival of blackberries continued this week and we added more fruit to the collection which was then frozen. When enough fruit has been collected over the next few weeks, we’ll produce a blackberry and rhubarb jam. The heat has meant that the tomatoes have also been rapidly ripening this week. 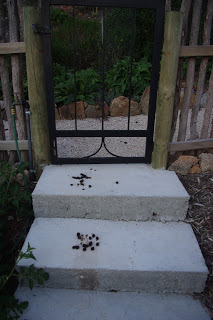 However, we are not the only ones who have been enjoying the tomatoes, because one night this week a wallaby succeeded in breaking into the tomato enclosure through the gate. The evidence was overwhelming. 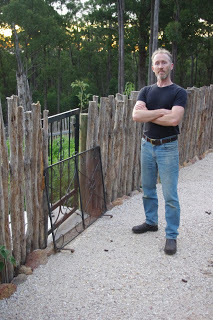 I’ve since placed a heavy duty steel mesh fire place screen over the gate and that may keep the wallabies out of the tomato enclosure for the foreseeable future. 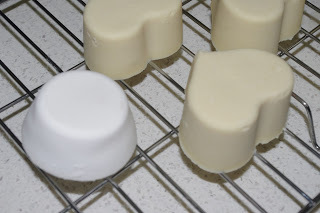 Here is an update of this week’s activities with the soap making. 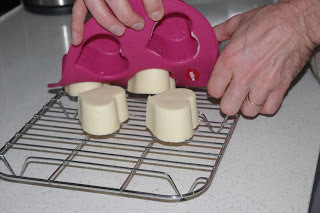 Common sense plays a big part in this recipe – Do not splash any of the solution onto you at any time and/or handle the soap cakes until they are firm. If you do get a splash on you wash with water and seek medical assistance. Use gloves at all times. The soap will cure to a white colour over the next few months. Do not use the soap for at least 2 months. The temperature outside now at about 7.00pm is 21.9’C degrees Celsius (71.4’F). 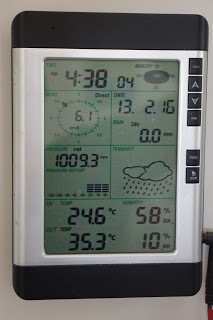 So far this year there has been 55.8mm (2.2 inches) of rainfall which is up from last week’s total 49.4mm (1.9 inches). The days are still hot here. And for the past few weeks the rain seems to have gone elsewhere. Blue skies and light winds are slowly turning to Autumn conditions and the nights have been both cool and clear. The plants are also showing signs of the approaching autumn. Today the blackberries have almost finished supplying their delicious berries. Blackberries are one of my favourite berries, as to me they taste of the summer sunshine. It is very considerate of the plants to capture that taste. Blackberry plants are also virtually indestructible and will produce huge quantities of fruit even in the sort of hot and dry summer conditions like this one. It is a surprise to me when people tell me how much they don’t like blackberries. 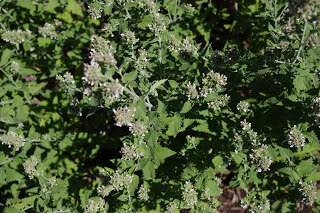 Or they describe the plant as a noxious weed – whatever that means. The local council in this mountain range sprays herbicide on many of the blackberry canes. That spraying unfortunately produces a huge quantity of dry flammable material a month or two later at the height of summer, which is a serious fire risk. The blackberries however, don’t seem to mind the herbicide as two years later they grow back and look more or less the same to me. Not everyone is as excited about the blackberry bush as I am. So I undertook a bit of an investigation to find out what all of the fuss was about. No research on any fruit is complete without opening Dr Louis Glowinski’s most excellent book: “The complete book of fruit growing in Australia”. It really is a complete book as he covers over 200 fruits growing in Australia. He writes about the blackberry: “Well, it is rumoured that blackberries are invasive plants, weeds that can take over a garden, are hard to manage, and unless carefully tended become a tangled mess and hardly bear at all. And unfortunately the rumours are correct.” However, on the other hand he also writes: “These most luscious of fruits are so delicate that their indescribably delicious flavour can only be experienced by those lucky folks able to select their berries direct from the vine”. I note that those observations indicate that the plant is equal parts friend and foe. Even Pliny the Elder weighed in to the dirty blackberry dogfight with the opinion: “the blackberry’s habit of spreading by tip layers (which is a fancy name for a new plant appearing wherever the end of a cane hits the ground) ‘in a manner that would fill up the whole place if resistance were not offered by cultivation’. I believe he reckons the plant is a bit weedy! However, I also note that in the Middle Ages the plants were also used for wine, making blue dye and for medicines especially to soothe the throat and eyes. So again, the blackberry plants are both friend and foe! The Victorian state government has a website devoted to weeds and blackberry is listed as one of those plants. Of particular interest on that website was the statistic that there are over 2,000 named entities in the Rubus fruticosus aggregate, and that all of the blackberry species in the aggregate that are found in Australia are of European origin. So who knows what the blackberry plants are in your area? All I know is that the blackberry fruit which I pick locally can be turned into jam and wine and it is a real shame to me that the blackberry picking season is now over. For the past few weeks the editor and I have been picking blackberries from a secluded spot in the local forest. 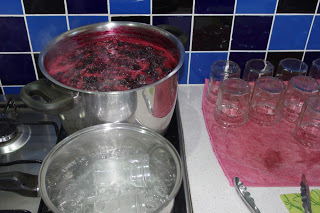 Once the berries are brought back to the kitchen, they are cleaned and frozen until the end of the season, at which point they are converted into jam and wine. And today is that day! 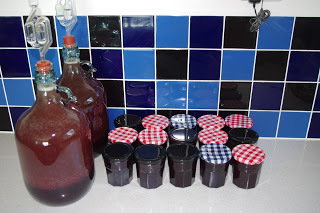 Today, the editor wove her magic in the kitchen and produced blackberry and rhubarb jam as well as two demijohns of blackberry wine. The jam will stay fresh for over two years, whilst we are working towards ageing all of the wines for at least 12 months. This time of year the farm activities are all about preserving the glut of summer produce for consumption over the following months when the sun is low in the sky and the air is cold and summer is far away. 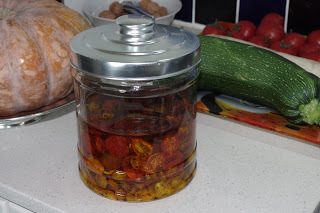 Sun dried tomatoes (using the solar power of course) have to be stored in olive oil once processed, to ensure that they do not come into contact with the air which may potentially cause them to become inedible and/or toxic. Fortunately there are many quality olive oil plantations nearby and olive oil is of a very high quality and excellent taste. Our sun dried tomatoes will be used both on fresh bread and pizza as the dehydration process really concentrates the flavour. 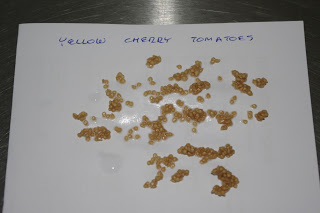 Seed saving for particular varieties of tomatoes has commenced this week. 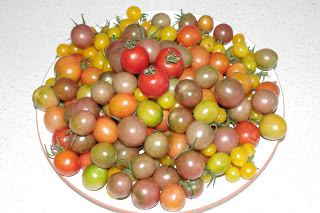 We grow cherry tomatoes which are yellow, red, yellow/green, and black Russian varieties, and we will be selecting seed over the next few weeks from the best tasting fruit with the most vigorous growth. Generally the seeds are left in water for three days so that the natural fermentation process that occurs kills off any nasties that may exist on the seeds and cause them to spoil. The seeds are then left on paper to dry and stored for the next season (which begins in late August / early September here). 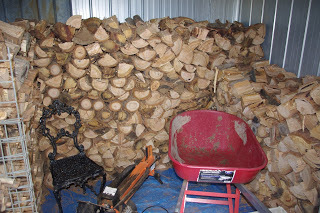 Another form of storing the summer surplus is storing the cut and split firewood in the original firewood shed. Firewood is hard, hot work and it is a pleasure to see the original firewood shed slowly filling up. Did I mention already that this summer has been particularly hot and dry? Well, since the beginning of the year, each week has produced a little bit of rain, but overall not much more than two inches of rain has fallen so far this year. 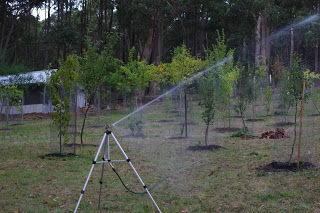 Despite those conditions I’ve been managing the water resources reasonably well and have a bit of spare capacity to spray in the dry orchard. With that in mind, the other afternoon I raced off to the local hardware store to see whether they had a water sprinkler on a stand which I could place in the orchard. The hardware store did one better than that! They had a number of water sprinklers on tripods which they told me no one wanted to purchase, so I availed myself of two of them. Being on a tripod with adjustable length legs the sprinklers are almost perfect for anyone who lives on the side of a mountain. 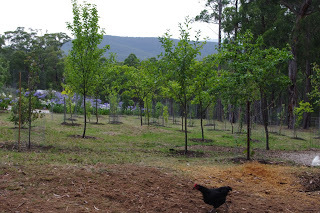 Last week I introduced five new chickens to the farm and it is with pleasure that I announce that the new chickens are doing quite well and really enjoy their evenings roaming around the orchard looking for choice greens and grubs! The new chickens enjoy their evenings roaming around the orchard looking for choice greens and grubs! The chickens here are totally spoilt rotten! 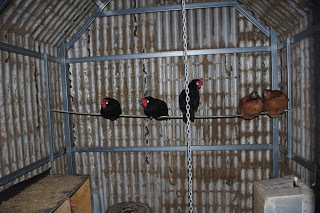 A few months ago, I installed a swing in the chicken enclosure for the chickens to jump and play around on. Unfortunately, none of the chickens ever enjoyed the swing, so today, I removed the swing and installed a solid steel perch in its place within the chicken enclosure. Within a few minutes the chickens were jumping all over it. 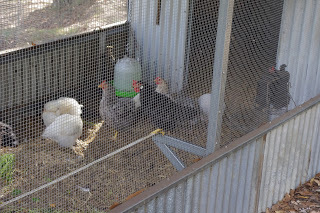 Observant readers will note that in the photo below one of the new leghorn chickens is on the steel perch! The temperature outside now at about 7.15pm is 18.4’C degrees Celsius (65.1’F). So far this year there has been 57.8mm (2.3 inches) of rainfall which is up from last week’s total 55.8mm (2.2 inches).